Whenever I get eggplant I think about making this dish. If I also have okra, my friends and family are in for an Indian delight. Nothing makes Indian food better than fresh vegetables and good quality oil. 1 medium eggplant, chopped into 1/2 inch cubes and then soaked for 15 minutes or more in water with salt. Strain in colander. Sauté until translucent (or nearly so). Add eggplant and continue to sauté, stirring every 3-4 minutes. Do not stir too frequently – give time for each side of the eggplant cubes to cook. 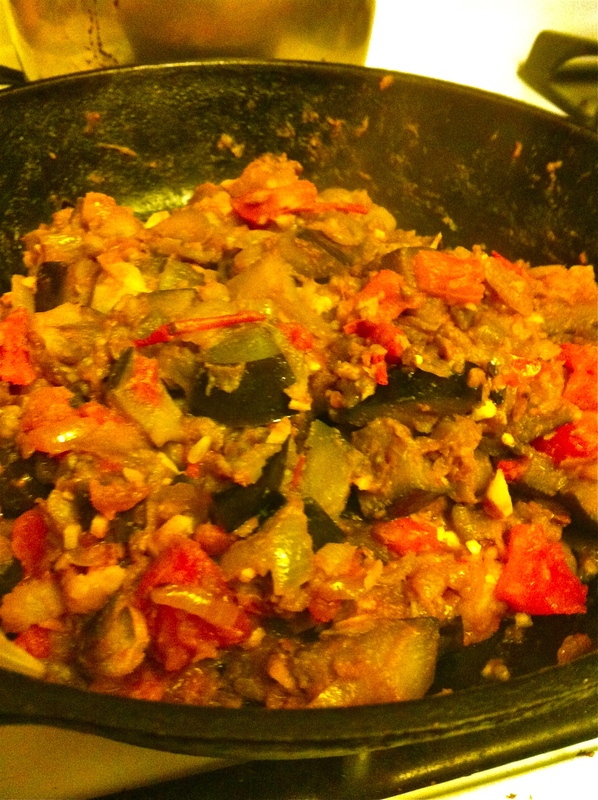 When the juices of the tomato have cooked off, test eggplant with knife – when soft all the way through, it is done. If it is still a little hard in the center of the bigger pieces, give it a little more time. Serve on basmati rice, with Marsala Bhindi (Okra) and Dal. This entry was posted in Main courses, Recipes and tagged Asian, local. Bookmark the permalink. Both comments and trackbacks are currently closed.